This imaginary island lagoon was inspired by Venezuela’s Canaima National Park, the location of Angel Falls, the highest waterfall in the world. The falls originate from a cleft near the summit of Auyantepui, the most famous of the tepuis, sandstone mountains dating back to a time when South America and Africa were part of a super-continent. 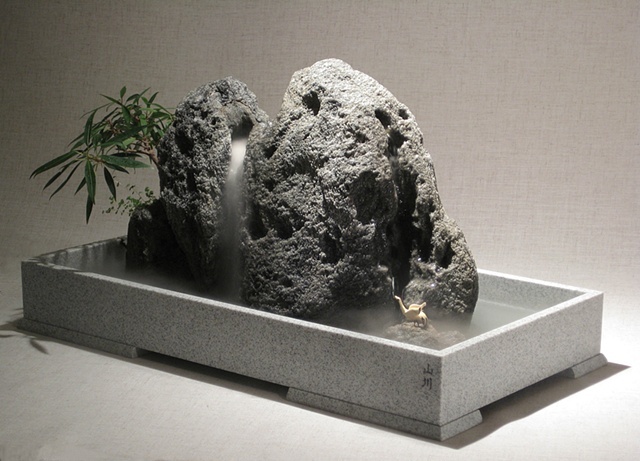 The cleft for the waterfall in this sculpture was created in a large feather rock to produce a cascade of mist, created by a miniature pump and ultrasonic mister. A ceramic crane views these falls from a nearby rock.